Med den här Stereo AV Balunen med IR (Hona) kan man ta emot både ljud, bild och fjärrkontrolls signaler över en enkel nätverkskabel. Balunerna används i par men säljs separat. Du kan kombinera denna balunen med sig själv eller med en Stereo AV balun med IR ( Hane ). 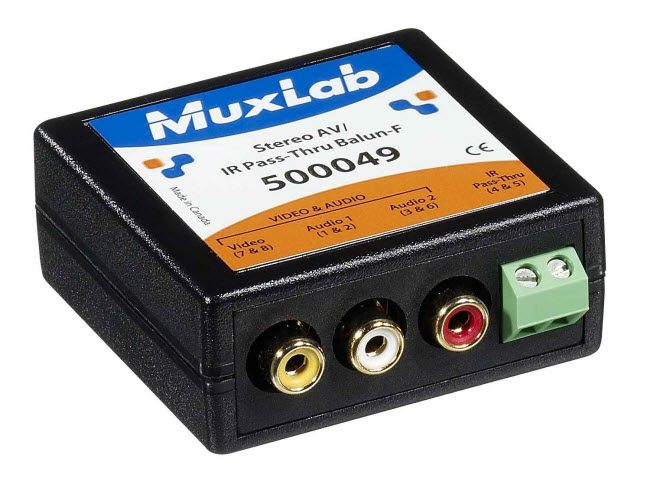 The Stereo AV/IR Pass-Thru Balun (500048, 500049) allows one (1) composite video, one (1) stereo audio and one (1) IR emitter signal to be transmitted via a single Cat5E/6 cable in a point-to-point connection. The Stereo AV/IR Pass-Thru Balun features full audio bandwidth response for high fidelity applications and features built-in color-coded cable leads for ease of installation. The Stereo AV/IR Pass-Thru Balun also works in conjunction with third party IR Remote Control equipment allowing the IR Emitter to connected the IR control module using the same Cat5E/6 cable as video and audio for more cost-efficient cabling. Some of the applications are: classroom video distribution, commercial and home audio/video systems, hospital video training, video conferencing, and video kiosks.